It's back to blogging after the holiday weekend. On this Monday we bring a very cool tour to our readers today. Dragons! We are the final stop on the Skydreamer Review Tour hosted by Goddess Fish Promotions. There's our review and a tour-wide giveaway. Good luck and thanks for stopping by. Jaden is one in a million, a fire talent capable of bonding with a fire Esprit and creating fireballs of enormous proportions. Draven Winterbourn is the devilishly handsome king of the Dragon-Changers, capable of changing into an enormous dragon. A man responsible for keeping the laws of his people. When the two meet it was more than fate, it was true love. So how can everything go so wrong between a couple who love so much? Rating: 5 of 5 LOVED IT! Cover comment: Nice mix of colors, especially with Jaden's hair. Not crazy about the thin font used for author's name. I began reading Skydreamer on a Saturday morning and found that I simply couldn't put it down. This easily became a one sitting read. Author Sheryl Winters has created quite an engaging fantasy with lots of romance, action, and dragons. The world intrigued me and kept me completely engaged in it. First off, I thought the idea of Esprits, the special abilities the human girls had, were extremely cool. These talents disembark from their hosts, have names, and can do things like babysit. COOL. Jaden is a Fire Talent (hers is named Esmay), her twin sister Isla is a Water Talent (hers is named Icia) and their little sister Adania is an Earth Talent (she's learning and can conjure a small dirt golem, Mr. Dirty). These sisters are immediately likable and their backstory makes them sympathetic. I'm so glad the story is told by the twins. Reading from both of their perspectives helped immerse me into their incredible world. I wound up loving them both (and their little sister too). After enduring the loss of their parents, the sisters, 18, want to enter a contest to try and win a large monetary prize. Money would help the girls support Adania and pay for her education. Surprisingly, Jaden takes the top honor. Family is a strong theme in this book, with both the humans and the dragons. The winner also winds up marrying a Dragon-Changer King. The trials Jaden and her friend endure may be brutal but they're interesting. Did I say there were dragons? Yes, I did. King Draven Winterbourn first comes across as mysterious and the looks he shared with Jaden will excite anyone who enjoys romance. Their wedding ceremony is not only cute, it's funny (well, I don't think the Queen found it humorous but you'll have to read the book) and I knew Draven would be swoon worthy. He was (as was his twin, Ra'von). Life puts the Zarie girls through changes and I enjoyed seeing them change and deal with the different situations which popped up. Winters kept me entertained with her twists and turns. The party scene and ending certainly caught me by surprise. Since I feel so strongly about this book, I will mention I felt there could have been more worldbuilding with both the worlds of the Dragon-Changers world and the humans. There were also mentions about an impending war with orcs, the 'whispering' of dignitaries, and threats made by the girls' uncle, all of which I viewed as foreshadowing, but did not find followed through by the end. There's so much to love in Skydreamer. From the fantastical people and places to the writing style, I loved it! The various emotions I felt throughout reading were proof. I laughed, got teary eyed, I wanted to ride on the back of a dragon and ice dance with Isla. I can only hope that Sheryl Winters will continue this with a series. There was such a large cast of characters including the children, I bet there are plenty more tales to tell. I would love to read more of Isla's wonderful ice talent and Ra'von. My list goes on. I know one reader who will surely grab them up--me! Sheryl will be awarding a $10 Amazon or B&N gift card to a randomly drawn winner via rafflecopter during the tour. Dragons?! That definitely caught my interest! Dragons are always good Linda. Except when their bad!! A great review. I love finding books I can't put down. Hi Mary. I also love finding books I can't put down. They are so few and far between that when I find one, I like to hoard it and read it very slowly so that I can savor every second. Hi Rita. Thank you for stopping by. 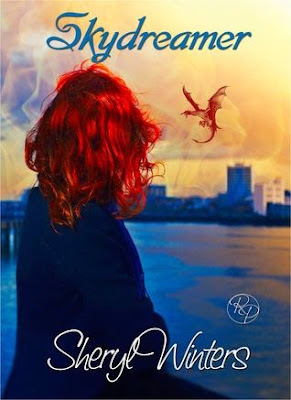 This sounds like a must read for me because I love books with dragons - thanks for the review! Books with dragons in them are always a good read! Well, mostly always! lol. Thank you for stopping by Maria. And thank you for stopping by! Glad you enjoyed the excerpt. It's one of my favorites. Great Expert loved it thank you. Thank you Joe and Amy. I really enjoy putting excerpts out there and I truly enjoy Rebecca Hart's talents on the cover. As a writer you worry about your cover and I was very pleased to find out I have completely fallen in love with it! Fantastic review!! I'm in the process of reading it right now and I love the characters and the depth of the story. If you love dragons and romance and quirkiness and a well-told tale, grab a copy of Skydreamer. Awesome. Great review. I LOVED this book too. Young girls, dragons, growing and learning to live together, how cool is that? Sheryl Winter did an excellent job.